This Sunday, May 2, I’m preaching a sermon entitled, “Learning to Be Content.” The text is Philippians 4:10-13, which includes Paul’s words, “I have learned to be content with whatever I have.” Can you imagine such a thing? I can imagine it—and even experience it, however fleetingly—but I am still in the learning process, believe me! What was the secret to Paul’s contentment? What is it about being a Christian that ought to make us feel content and at peace? If there’s some secret to it, let’s try to figure it out this Sunday. 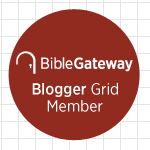 Beginning on Mother’s Day, May 9, and lasting—appropriately enough—through Father’s Day, June 20, is a 7-part sermon series on families in the Bible. Each week, we’ll focus on a different family relationship, with special music related to these themes and a video montage of church members talking about their families. May 9: Mothers and Sons. Genesis 25:19-28; 27:1-17, 41-45. We’ll focus on Rebekah and her relationship with Jacob. May 16: Sisters. Luke 10:38-42. Mary and Martha. May 23: Brothers. Genesis 33:1-17. Jacob and Esau. May 30: Husbands and Wives. Genesis 2:18-25. Adam and Eve. June 20: Fathers and Sons. Luke 15:11-32. The prodigal son, his father, and his older brother. As we have just finished our two-part sermon series on John 21, “Life’s a Beach,” I wanted to tie up a couple of loose ends in John 21. The scholarly consensus is that this chapter was added later as an epilogue to John 1-20, which is possibly why John 20:30-31 seems to serve as a tidy ending to the original book. Sometimes—as bad as I hate to say it—I worry that TV is not good for me. Really, that’s true of most popular culture—of which I am often a ravenous consumer. “Don’t worry,” I console myself. “It’s all sermon research! If I didn’t watch TV, where would I get sermon illustrations?” I’ve wondered at times if I could write off a high-definition TV as a business expense. J.B. Phillips (d. 1982) was a canon of the Anglican church and a writer. Fifty years ago, he wrote a little book called Your God is Too Small. Although the book predates the explosive growth of TV viewership and so many other trends that have contributed to a dumbing-down of pop culture, what he says about pop culture and its relationship to religion couldn’t be more on target. I found this today on the Daily Office website. The idea that we live in something called “the environment”… is utterly preposterous. This word came into use because of the pretentiousness of learned experts who were embarrassed by the religious associations of “Creation” and who thought “world” too mundane. But “environment” means that which surrounds or encircles us; it means a world separate from ourselves, outside us. The real state of things, of course, is far more complex and intimate and interesting than that. The world that environs us, that is around us, is also within us. We are made of it; we eat, drink, and breathe it; it is bone of our bone and flesh of our flesh. It is also a Creation, a holy mystery, made for and to some extent by creatures, some but by no means all of whom are humans. This world, this Creation, belongs in a limited sense to us, for we may rightfully require certain things of it—the things necessary to keep us fully alive as the kind of creature we are—but we also belong to it, and it makes certain rightful claims on us: that we care properly for it, that we leave it undiminished not just to our children but to all the creatures who will live in it after us. None of this intimacy and responsibility is conveyed by the word environment. The following is an original manuscript of the sermon. 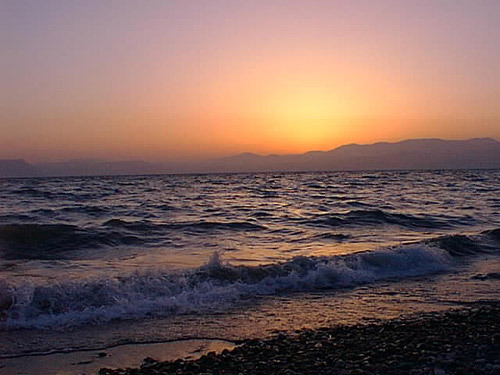 Daybreak at the Sea of Galilee. Does anyone know when it was decided to cancel spring this year? I mean, I know we had a harsh winter, but we didn’t have to go straight to summer, did we? Actually, if we were going to cancel spring, we might have also cancelled pollen! I’m not really complaining much. But just in time for summer, we have today’s scripture. It has two of my favorite activities in the world: hanging out on the beach and grilling! Throw in a boom box playing the Beach Boys, and it’s my idea of heaven! And Jesus is there. And what else do we learn in this text: charcoal really is better than propane because, after all, it’s what Jesus used! 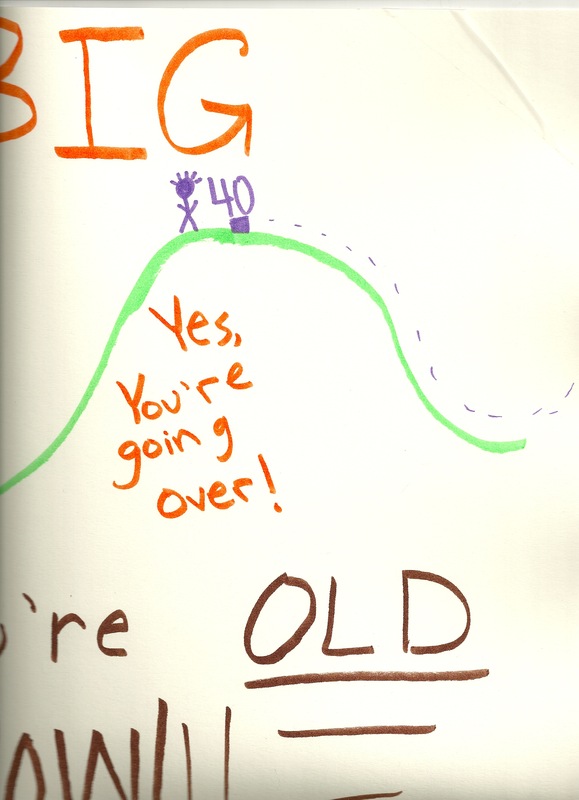 A detail from Elisa's birthday poster: Yes, I'm over the hill. I wrote this song after I turned 40 in February. Forty is a nice round number—the official beginning of middle age. It’s a number that affords taking stock of one’s life, surrendering to the temptation to ask, “Where am I now? What have I accomplished? What do I have to show for these four decades on earth?” Life begins at 40, some well-intentioned friends consoled me. Yeah, right! John Lennon was dead at 40—and look at what he had accomplished by then! Regret is the devil. Former Mr. Might-Have-Been, would you please make friends with the skin you’re in? This Sunday is the third Sunday of Easter. The Lectionary gospel passage is John 21:1-19. As I’ve been studying and reflecting on this scripture, however, I think this passage is too rich for one sermon. There’s too much interesting stuff going on. This Sunday, I’ll focus on vv. 1-14, which deals with the disciples’ miraculous catch of fish and their encounter with the resurrected Lord. Next Sunday, I’ll focus on Peter’s reconciliation with Jesus and those curious words about the beloved disciple in vv. 15-25. Why do you think the disciples decided to go fishing after the events of Easter Sunday—and the following week, when Jesus appeared to Thomas? (See John 20.) Is there more going on here than just fishing? Why the emphasis on this abundant catch? What’s the point? What do these verses have to say to us? We’ll explore these questions and more on Sunday. See you there. This Sunday, our high school youth minister Jay Gulbin and the high school youth band will be leading in worship—which makes me wish I was going to be there! Please pray for me as I prepare to go before the Board of Ordained Ministry for interviews on Monday.